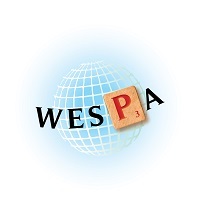 WESPA's Ratings Committee monitors and evaluates the effectiveness of different ratings systems, to achieve the fairest possible rating of all international players. The WESPA Ratings Officer updates the ratings file using the latest results of approved tournaments. Rankings are given to those who have played in the past two years and have reached 50 games in international WESPA-rated tournaments. The WESPA ratings levy is US$2 per player for non-member associations and US$1 per player for member associations, with a minimum total levy of $20. You must have a PayPal account. See our Tournament Calendar for further information on rating tournaments. Contact our Treasurer if you have any queries regarding payment of the Ratings Levy. You can view the current International Rankings for players active in the last two years with a minimum of 50 games played. The full list of players is available in the Ratings file above. You can also search for players below.